Google launched a new experience today that it's calling Talk to Books. It's pretty much what it sounds like: the demo asks for input in the form of regular old sentences, then tries to locate logical responses to those sentences from a pool of books. 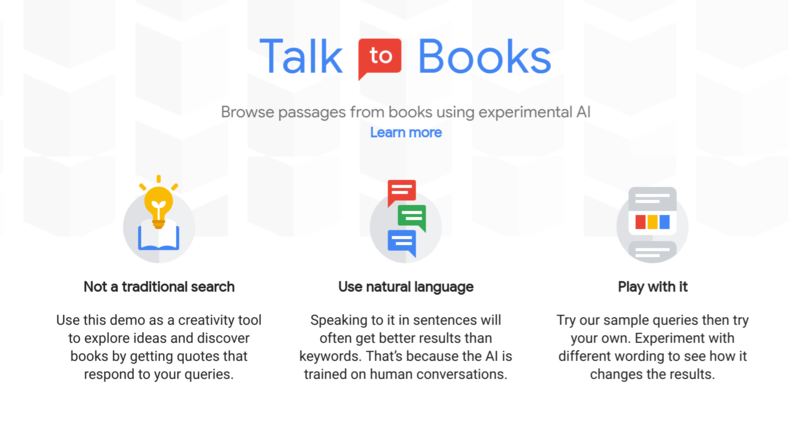 In a post on its Developer Blog, Google calls Talk to Books "an entirely new way to explore books by starting at the sentence level, rather than the author or topic level." The experiment is meant to showcase advances in machine learning that let computers communicate in ways that seem natural. Feed the engine full sentences, and it "searches all the sentences in over 100,000 books to find the ones that respond to your input based on semantic meaning at the sentence level." So if you ask it a question, it'll do its best to answer with a passage from one of the books at its disposal. If you give it a statement, it'll try to find something that seems like a logical reply in a conversation. Responses to inputs shown in bold in the context of the passage they came from. 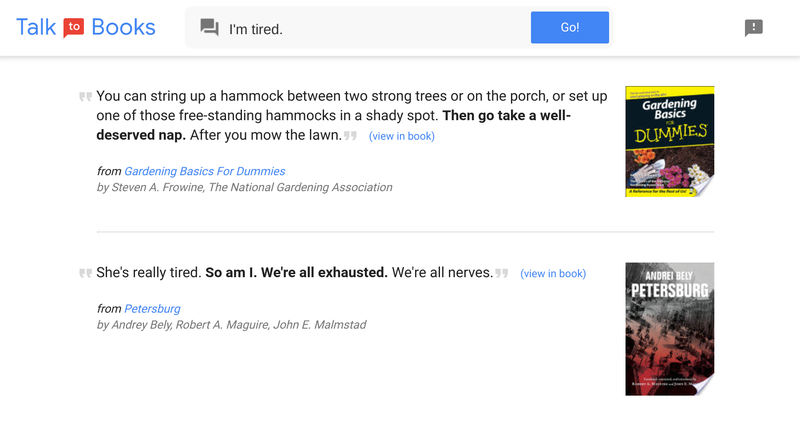 Google cautions that "Talk to Books is more of a creative tool than a way to find specific answers;" responses aren't screened for accuracy or relevance, so don't use it for medical advice or anything. But it's certainly fun, and it's easy to imagine how this type of technology could be applied to make full consumer products like the Google Assistant that much more pleasant to use.